"Shabbot Shalom" - and "Thank you!" I especially like your statement that "Israel possesses an incarnational dimension." In regard to the government of Israel, I wonder if the rest of us could let the people of Israel govern themselves. Thank you so much for writing the article. It gives me much to reflect on. I am Roman Catholic and have many Jewish friends and have worked with them. I know how important Israel is to them but it was not explained as eloquently as you stated it. I have a better understanding. 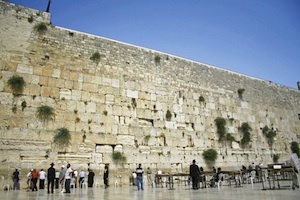 I have encouraged a Jewish friend of mine for some time to go visit there. I think it would be a powerful experience. I will share your quote, "It is the embodiment of the Jews’ collective past, situating us in our story and evoking its meaning." We share your history in the Readings of the Old Testament and I pray for Israel and that there will be more open dialogue. I am reading Bonhoeffer's biography which is giving me more insight into what took place in Nazi Germany and that we have a responsibility to speak up when we see evil and where there are injustices. Thank you again for keeping the diaglogue open and educating us about the Jewish people. I will pray for the State of Israel and its people. I am disturbed with what is going on in that region. This article put in perspctive the historical and religious/spiritual roots of Judiaism. As the Rabbi points out there is much more than politics at work in Isreal, but it appears to me that his article his arguement could equally be said about the Palistininans. With both (and Christans) laying claim to the land, I wonder how Jews, Palistinians and Christian (to a lesser degree) will resolve this morass. Yet the violence only perpetutes more violence and another generation grows up feeling persecuted. May Jerusalem (Isreal) find a true path to peace. Thank you so very much for this heartfelt, moving and touching piece, Rabbi Polish. As I have written in another blog, if we can share our pains, griefs, and sorrows, with one another, we will recognize and understand that we belong together as human beings. And it is in our humanity that we know for sure that we were created with dignity and deserving of respect. And it is also in our humanity that God meets us. Upon reading this article, my concern was why the Rabbi's main point was that christians "seem unaware of the profound nature..." My puzzlement is why the Rabbi is reminding catholics (and others) of that which is no obvious and so expected. This was underscored in my brain upon my unexpected reading recently of "the children of the ghetto ", Israel Zangwell. written in 1892. (brillant book!). as a serious catholic person, i've always felt very much welded to the jews by spiritual inheritance and by historical reality. Can't imagine any jew, secular or religious, not having a deep identity with israel. Both logic and empathy compel all of us, I think, to accept and embrace Israel. It's when you move beyond those fundamentals that thoughts and emotions become muddied. Part of the mud, certainly, is an anti-Jewish impulse that seems not to die, and part is realpolitik, which denies any value beyond the immediately pragmatic. Part, also, is an arrogant righteousness that demands the sacrifice of one people to please another. This latter is, I think, particularly pernicious. The RCC and Judaism (now under its proper name Zionism) have experienced many a harsh ambivalence and even antipathy.... on both sides. The RCC has learned to cozy up to all rightwing powers, notoriously so in WWII. Now I am afraid the above Love-Fest shows the extreme straits that the bishops find themselves in. They know how to read the 90% vote in the congress denouncing the Goldstone Report on the slaughter of the innocents (of 410 children).
" O coz, coz, coz, my pretty little coz, thou shouldst know how many FATHOM DEEP I am in love." As an American Christian, I support an Israeli state. I do so, realizing, as Rabbi Polish hints, that I do not fully grasp the essential meaning of an Israeli state for the Jewish people. However, neither do I adhere to the anthropocentric view that God takes sides in military conflict. The problem with the original Promised Land is that it was already occupied, requiring a military campaign of conquest and expansion. But before we throw stones at the Israeli government in the present conflict, we should look at our own historical backyard. The idea of a "manifest destiny" was used to push back, and outright exterminate, the native dwellers of the Americas, to make room for us. Now, the descendents of the original Native Americans are relegated to isolation and poverty. The historical beginnings of both the U.S. and Israel are mired in the perception of a God-given right to resort to military violence. The outcome is always short-lived and ineffective. A solution can only come with inclusivity and non-violence. Daniel F. Polish's heartfelt sentiments regarding the State of Israel ("A Spiritual Home," April 11) merit attentive and sympathetic reading. I wish, however, that he had not taken offense at the Kairos Palestine document, a Palestinian Christian manifesto calling for justice, peace, and love among all the inhabitants of the Holy Land, and embracing all ethnicities and religions. Rabbi Polish complains that Kairos Palestine "sets out an offensive disconnection between Jews and the Land of Israel as the cradle of our civilization." I do not see this "disconnection" anywhere in the document. Nowhere is there any challenge to Israel's right to exist in peace and security within its pre-1967 borders. The injustice that the document decries is explicitly identified as the 1967 (and subsequent) occupation of Palestinian lands, with the expansion of the settlements (illegal under the Geneva Convention) and the concomitant usurpation of land and water resources. Kairos Palestine even states, "Our message to the Jews tells them: . . . we are able to love and live together." I cannot imagine a more irenic document, given the oppression that the Palestinians are currently suffering. The Palestinian Christian leaders who have endorsed Kairos Palestine should be commended for their generosity of spirit. Daniel Polish claims to be "pained by the actions of religious communities that have been partners of the Jewish community in dialogue." He then identifies the 2009 Kairos Palestine document as one cause of the pain. This document, subtitled: "A Moment of Truth; a word of faith, hope and love from the heart of Palestinian suffering" describes the pain of Palestinian Christians who have lived in Israel/Palestine for the past 2,000 years and who now experience injustice and occupation. In no way does the document minimize the suffering of the Jewish people in the past; rather it simply requests justice and dignity for all...Israeli and Palestinian alike...Jew, Muslim, Christian and non-believer. This document, signed by the Patriarchs and Heads of Churches in Jerusalem, unfortunately has not had wide distribution in the churches in the United States. However, it should be read next to Rabbi Polish's article. It can be accessed on the internet at Kairos Palestine. I've not read it through, but it starts off with an anti-Israel slant, so that's probably how it continues. I am surprised and disappointed that AMERICA would pubish Rabbi Polish's essay without an accompanying counter-view. Rabbi Polish's argument that Jewish identity is intimately bound up with the land of Israel is certainly true, but his claim that this emotional bond has "nothing to do with the actions and policies of the Israeli government" seems naive. His attempts to easily separate Jewish identity from political realities smacks of exclusivism and nativism. No rational person disputes Israel's claim to the homeland established in 1948. But when the leaders of the state of Israel, supported de facto by many devout Jews throughout the world, systematically destroy Palestinian homes, expropriate their land, control water and food supplies, and build a garrison military state against their neighbors, such actions are very much a part of the "dream"of a future greater Israel. What would Rabbi Polish say to a German in the mid-1930's, or a Serb or Croat in the 1990's, who claimed that their spiritual/emotional tie to their homeland was "beyond the realm of the political," as he claims for present-day Jews? This article also appeared in print, under the headline "A Spiritual Home," in the April 11, 2011 issue. Rabbi Daniel F. Polish, a frequent contributor to America, leads Congregation Shir Chadash in New York’s Hudson Valley. His latest book is Talking About God (SkyLight Paths Publishing).